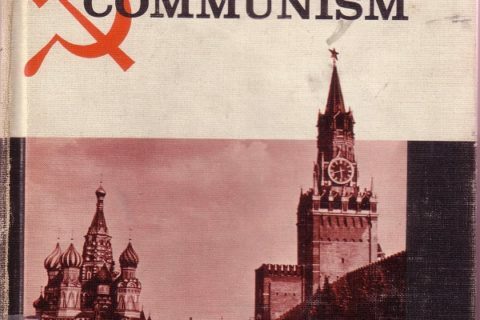 Since I started floating through catalogs, I have enjoyed using a keyword search for communists since usually there is something funny or dated. I came across this title. 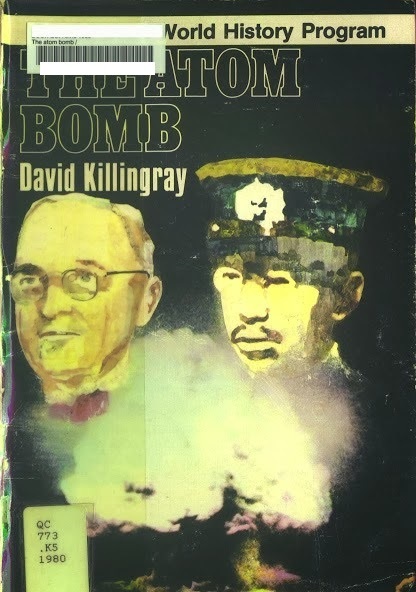 Any Cold War era publication is usually interesting. Even though I was just a kid during the 60’s, the paranoia was flying high and to associate anyone or anything with communism was essentially evil. This book fits neatly in the time frame of post war red scare. McCarthy started his witch hunt in 1950 (and was censured in 1954) and Julius and Ethel Rosenberg were executed in 1953. No doubt any collection highlighting the cold war hysteria should include this, but I think it is probably more appropriate for an academic audience or a large public library. My particular copy had seen better days…. probably the result of some poorly trained commie librarians and all their talk about information wanting to be free. I love when our expert librarians give us the whole story… please comment! 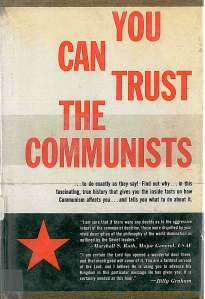 I’ll agree the book is horribly out of date and needs to be weeded, but sometimes you folks make it sound like it’s all hysteria to be afraid of communism. Yet historically speaking, communists have killed more people then the Holocaust and all (supposedly) “religious” wars. And now you’ve got communist run China who thinks it’s okay to hold Tibet hostage, give kids lead paint covered toys, sells highly flamable clothing to their own people, and even provides dry wall that has started to rot copper pipes and cause lung problems for people living in houses made with that same drywall. With all that, don’t you think there’s kind of a point to being afraid of communists? Historically speaking, they don’t seem to care much at all for human life. Also, check out the “About Beacon” page, the 3rd part mentions this dude’s earlier book (American Freedom and Catholic Power) and states that he took a “commendable balance”. I am fairly certain I used that book for my senior thesis in my political science major back in the early ’90s. The subject of my paper was ‘The Changing View of the Catholic Church on Nuclear Weapons During the Cold War.’ I remember that I got a C+, along with a comment from the professor that I’d clearly bitten off more than I could chew. Yeesh. And here I thought us Catholics were just a bunch of socialists! heh. All kidding aside, I enjoy, as do you, delving back into old ideas especially when the height of the hysteria was going on. It is very interesting the ideas and parallels people can draw. A reminder that it wasn’t so long ago that Catholics were in the position that Muslims are in today (in the US). I wonder what this fellow would think of the Supreme Court today, populated entirely by Catholics and Jews? The Polish dockworkers were Catholics, and revolted against communism…go figure! Solidarnosc! The concept of communism seems pretty sound, but the application has never gone well. Kinda like the concept of religion – when has the application gone very well? It all depends on who’s implementing the concepts and making the decisions… but don’t get me started on the Roman Curia. Mr. Blanshard looks like quite the suspicious and vigilant man. LB please don’t get started. This isn’t the place. The real problem was never Communism so much as totalitarianism. Communism was merely the platform that let dictators take over countries while pretending to be the people’s champion so that they won’t face so much resistance. Religion has been used similarly in the past as well, with dictators claiming to be God’s champion; but both communism and religion were tools for despots, not the cause of despots (IMO). And Jami, it is certainly reasonable to fear certain Communist regimes like the former Soviet Union and China today. But during the Red Scare people were scared of Communism *itself*, as if it were like a contagious disease which would infect Western countries and topple democratic governments. In hindsight, this fear now seems overblown. 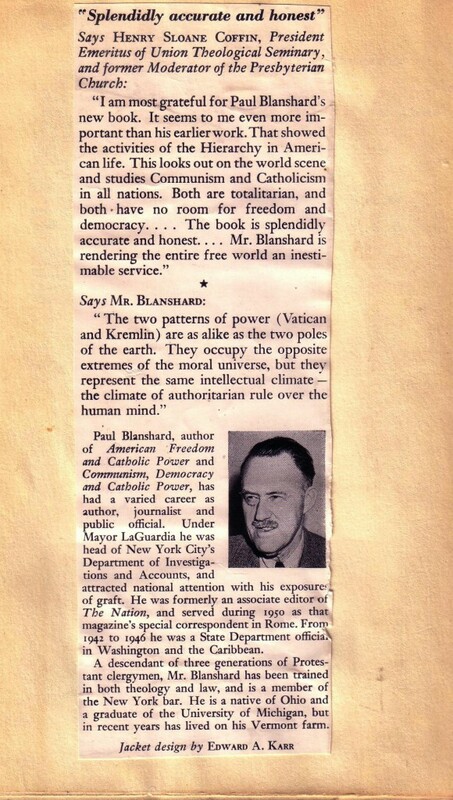 Blanshard was actually a left-winger, by the way, and it was Catholics, not Communists, who were his principal target. He was quite well-received in his day in The Nation and The New Republic (the latter much farther to the left at the time). What was seen in the USSR and Russia and all other communist country is and was not communism in its true form. Like Lihtox said, it was a platform for dictators to take over countries with little resistance. What we saw in ths USSR was more along state capitalism. Not even close to being communism. Karl Marx did NOT take care of his own social unit (family), yet we are to apply his principles to a wider scope of people, really? Not one of the communist countries have became that way willingly. McCarthy was silenced when he confronted Brigadier General Ralph Zwicker why he issued the formal orders promoting and then honorably discharging the known communist Irving Peress. Communism by its own proclamation can not live in peace with Capitialism. There was no end to the cold war rather communism changed its strategy, they would take us from within. So if you don’t know, check it, then you will know. Interesting premise that Catholicism is operating on the same level of Communism. Funnily enough Blanshard is correct with his research. The further right or further left you go, the less room for individual rights and opinions. Pope John Paul II is credited for helping to end Communism in eastern Europe. And on the other side of things, wasn’t the biggest Communist witchhunter an American Catholic, Joe McCarthy? I remember Catholics back in the day as being rather violently anti-Communist. This is an interesting book because it fits in an historical tradition of printed works which decry the “Popish Plot” which have been printed since Luther nailed his theses to the door and Henry VIII left the church. This book reminds me of the Beatles book in that Communist countries have no freedom of speech and would never listen to the Beatles. The premises of both are entriely wrong. And I’ll add that keeping a book like this would only be acceptable in a special collection which studies such things as historical artifacts. As a Catholic this book is as offensive to me as something like The Protocols of the Elders of Zion would be to a Jewish person–and that book is offensive to me as well as a thinking compassionate human being. This is hate literature, pure and simple. Thou hast said it, and I don’t event practice anymore. 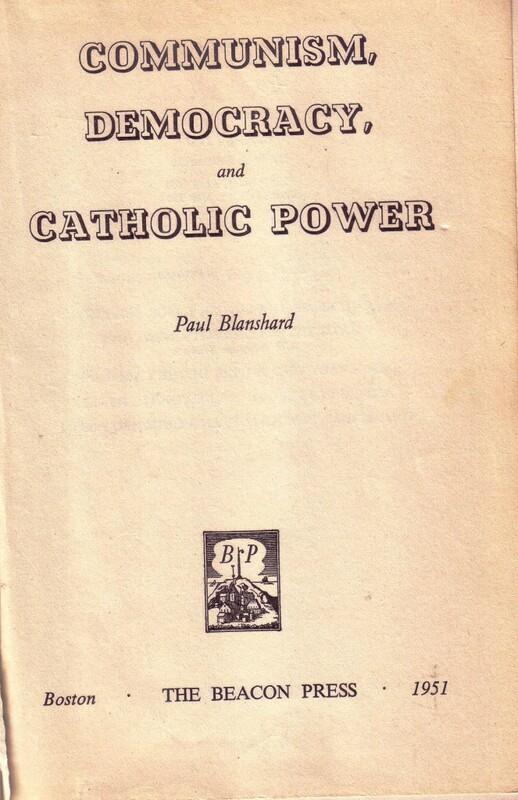 Blanshard does not equate Catholicism and Communism, he merely portrays them as equally evil. I recall the brouhaha around JFK’s election that was based on this kind of thinking. @Lihtox; @didi: communism was implemented in its purest form by the Authority in Cambodia. How did that go? Well, I leave you to go run and find out. (*****waits a bit****) Back? Okay. Finish reading “The Black Book of Communism for all the various ways pure hearted idealists around the globe gave communism a shot. Take a fundamentally flawed idea (the economic equivalent of flat-earth-ism) based on a fantasy of human nature (no matter how much or how little you work, you’ll get the same amount, unless you happen to be in charge of who gets what and how much, and then, of course, you’ll resist any selfish temptation to get more) and attempt to implement it. All the religions in the world haven’t managed collectively over thousands of years of history to match communism’s record in the century it’s been around.